Protect your vehicles and all your valuables from the harsh northwest weather! Do you have a custom street rod, motorcycle, boat, personal water-craft or travel trailer that you need to protect? We can erect on your property, the strongest, most cost effective and beautiful post frame Garage or Shop at an affordable cost that fits your budget! 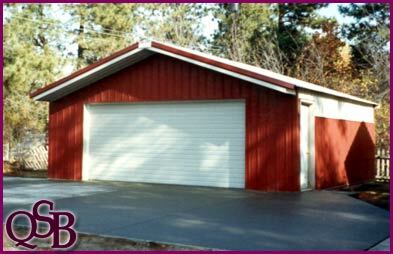 Here are a few of the beautiful garages and shops we have built for our customers. We can build a pole building like any of these pictured on our web site or you can design it the way you want it. Fill out the quote request or give us a call on our toll free number and we can get you a building quote today! There are many options available to dress up your garage or shop that can enhance the overall look of your new pole building. We can design it to match the look of your home so that your new pole building has continuity with your property. We have many colors to choose from for your roof, walls & trim and many earth tone colors. In most cases we already have the engineering done for your new building, and can obtain your permit and get you into our construction schedule right away. With all these features available to you and the most cost effective company in the industry, don’t delay, call today! (800) 775-0125.